An aesthetically and musically beautiful production of the Rodgers and Hammerstein classic, “The King and I” opened at the Marcus Center on April 9, to an appreciative audience that delighted in the King’s first use of his signature phrase “etcetera, etcetera” and gasped in awe as the King and his English governess-turned-confidant Anna twirled across the stage to the familiar “one two three and” rhythm of “Shall We Dance?” The tour is based on director Bartlett Sher’s highly acclaimed revival, which opened at Lincoln Center in 2015 and garnered four Tony Awards. Filled with grand scenes from the King’s court in 19th century Siam; opulent, richly detailed costumes in jewel tones and gold; and a gorgeous ballet sequence illustrating “The Small House of Uncle Thomas,” the show is part fairy tale, part spectacle and part resurrection of a true chestnut of musical theater. While it’s hailed as “based on a true story” of Anna Leonowens and her six-year stint as an English teacher in Thailand, not much of the source material for “The King and I” falls decidedly in the fiction category. The musical was adapted from Margaret Landon’s 1944 highly embroidered novel “Anna and the King of Siam.” This was, in turn, based on notes from Leonowens’s own sensational memoirs and her money-making lecture tour in America, where exaggeration and exoticism worked very much in her favor. Sher called it the story of “transition from a traditional culture to what really was a modern, industrial culture.” His staging focuses on the King’s progressive idea of educating his children (and wives who are currently in favor), and demonstrating a gradual shift away from slavery after the inhumanity of the practice is illustrated by Tuptim (a glorious Paulina Yeung), a captive “gift” from the court of nearby Burma. But the King still has plenty of other “barbaric” ideas that Anna tries to further reform; namely keeping a bevy of subservient wives and concubines; insisting that all his subjects show him respect by cowering on the ground “like toads;” and regarding women as an inferior class whose only purpose is to serve and please men. What’s left is a clash of two cultures — British and Siamese — and two strong, stubborn, outspoken characters; the proper widow schoolteacher and a virile monarch who is determined to save his country from colonizing forces by proving how civilized and enlightened his people are. Change, compromise, and mutual respect don’t come easily for these two, and the battle of wills over the course of the nearly three-hour show in engaging. As the King, Pedro Ka’Awaloa is an intellectually curious and calculating man who is also accustomed to getting his way through force and intimidation. An authoritative presence without being physically imposing, he delights in understanding Western texts and then subverting them for his own arguments. Ka’Awaloa’s singing voice is fine as he mulls over “predicaments,” and his persistent antagonism of Anna is reminiscent of the schoolboy pulling the pigtails of a girl he secretly likes. Much of the story’s emotional arc rests on Anna. 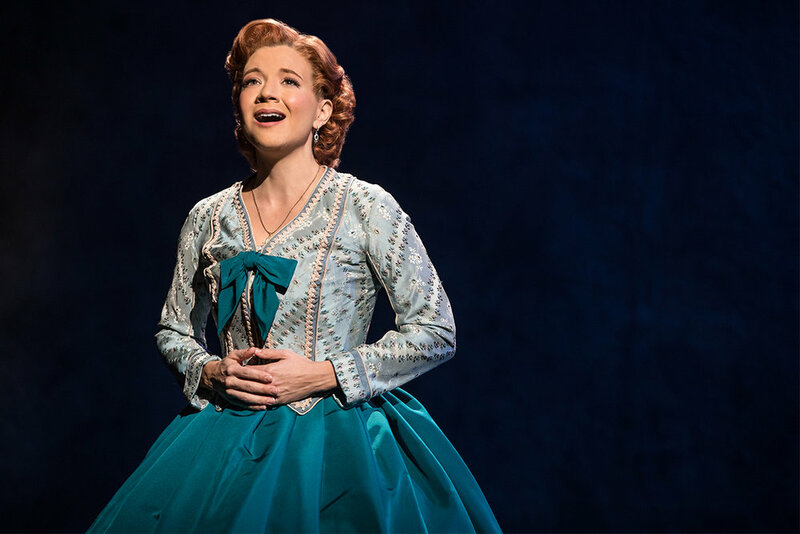 As played by Angela Baumgardner, she is not just a strong, independent educated woman, she is also a strict, stiff-upper-lip kind, and a sound alike for Emily Blunt’s recent turn as Mary Poppins. Emotionally closed — except where her affection for the aggressively cute palace children is concerned — her singing voice is similarly sweet and correct but reserved. Audiences need to look far past the character’s casual xenophobia to see her admiration for the King eventually shine through her disapproval of the entire culture. Although fans of the movie may remember “The King and I” for the sublimated love story between the titular main characters, the passionate, doomed affair between Lun Tha (Brandon Shan Chu) and Tuptim (Yeung) is much more compelling in this production. Their duets “We Kiss in the Shadows” and “I Have Dreamed” benefit from the young couple’s considerable operatic and musical theater training, as well as their radiant onstage chemistry. Seeing the willowy Yeung in Chu’s embrace, silhouetted against a curtain of flowers and shimmering light is the definition of romance. And hearing her silky soprano effortlessly ascending the scales is thrilling. An undeniable highlight of the second act is the “Small House of Uncle Thomas” ballet, choreographed by Christopher Gattelli, based on the original Jerome Kern concept. Framed as Tuptim’s adaptation of the Harriet Beecher Stowe novel of (almost) the same title, the narrated dance sequence is richly stylized and intensely physical, led by former NYC Ballet member Soraya Patoonsittichai as Eliza. Angular poses and elaborate costumes and masks make it a mesmerizing play within a play. Finally, Deanna Choi turns in a strong, measured performance as Lady Thiang, the head wife who must work deftly behind the scenes to manage and please the King. Regal in her bearing, her rendition of “Something Wonderful” is heartbreaking. So, how does the 68-year-old musical hold up? 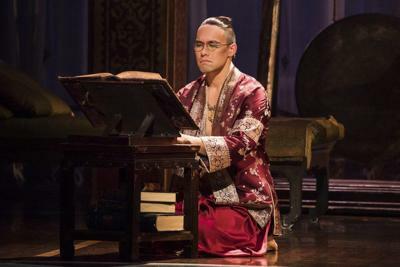 Well, in his review of the Lincoln Center production New York Times theater critic Ben Brantley called “The King and I” a “colonialist-minded musical that, by rights, should probably embarrass us in the age of political correctness.” He did, however, go on to give the show an excellent write-up. And like other classic musicals with problematic portrayals women and people of color, steps have been taken to update the production. The Thai culture is better represented through historically accurate costume and set design and Asian characters are played by Asian actors, which was not always the case, historically. The King and his family do not speak with exaggerated kung-fu movie accents. Instead they speak pidgin English, a language they are learning in order to bring the country “into the modern era.” In addition, the original violence against Tuptim has been softened, so when the King reverts back to ruling through force at the end of the musical, he is not quite the heartless monster that Anna brands him. But at a “teach-in” earlier this month in front of Madison’s Overture Center, a group of professors from the Asian American Studies Program at UW-Madison talked extensively about the stereotypical representation of Asians in Broadway musicals. There, this tour of “The King and I” played Overture Hall in March, and was followed five weeks later with the Vietnam War epic “Miss Saigon.” One of the speakers called the programming “a one-two punch” to the Asian community, since both pieces were penned by white authors leaning heavily on the archetypes of Orientalism, including exotically sexualized Asian women, emasculated Asian men and the white savior narrative. It’s important to remember when “The King and I” was written, and the inherent cultural biases of the script, given its authors’ world view and that of the audience it was originally created for. It’s also crucial to regard the story as a fantasy, instead of allowing these dated depictions of Asian culture to inform or reinforce real world biases. And before the next revamped tour of “The King and I” tours the country, it is my sincere hope that audiences have access to a much wider variety of stories on stage, written by the people that are portrayed in them.